Told you it was coming soon...Let's just get right down to it, shall we? 2. 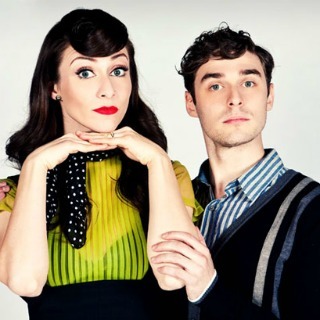 "Brokenhearted" by Karmin - The quirky pop duo (right) recently made a splash on SNL and instantly wooed me (and I'm sure countless others) with their debut original single. These YouTube sensations, a.k.a. Amy Heidemann and Nick Noonan, have gone from the web to a record deal to national television in less than a year. And yes, a full-length album is being prepped for an April drop. If my Spidey sense is correct, these guys are about to blow the f**k up. 3. "Starships" by Nicki Minaj - Summertime. In three-and-a-half minutes of RedOne-crafted frivolity. 8. "Turn Up The Music" by Chris Brown - Although Mr. Brown is a douchebag-prick of assholish proportions (as seen in his post-Grammy tweets), I hesitate to include one of his tracks on here. And if it means anything to the mutual haters out there, I didn't pay for this song. 9. "Give Me All Your Luvin' (Party Rock Remix)" by Madonna feat. LMFAO & Nicki Minaj - A more tolerable version of Madge's attempt to win over today's kiddies. Ironic, though, since she complains that "every record sounds the same" while being reformatted to sound like everything else on the radio. 10. "In The Way" by Penguin Prison - Chris Glover & Co. continue to bring the electro-funk. 16. "La Isla Bonita" by Ricky Martin and Naya Rivera - Who knew this dancier reignition of the Madonna classic would be so good? 17. "Let Me Be Your Star" by Katharine McPhee & Megan Hilty - It looks as if we've entered the Smash era (sorry, Glee), and the former Idol runner-up finally gets her moment in the spotlight six years later. 20. "I Can Only Imagine" by David Guetta feat. Lil Wayne and Chris Brown - See #8 above. Besides, this is Guetta's baby. 22. "Dynamo" by Vincent Did It - He's the artist formerly known as Frankmusik (damn those pesky record label disputes! ), and he's back with a vengeance. 26. "Your Love" by Fay Wolf - To wind things down, sit back and get lost in this beautifully haunting rendition of the 80s classic. *And yes, Volume 3 is already in the works as well.